Do you like to travel? Are you visiting other countries, towns and picturesque small villages? Maybe you don't travel often, but we do not doubt that at least once a year you book a summer vacation to get away from monotony and sultry summer days. Besides enjoying the beach, the water and the sun all day long, you will probably go out to dinner at a restaurant. How to find a good one? And what is considered as a good restaurant? Does it have to be one of the most expensive or the one which offers the variety of dishes? The guideline to help you find a good restaurant could be a booklet called „Top 100 leading Croatian restaurants“. This project, initiated by a company from Opatija called Abisal, has a purpose to accurately present the highest level of food quality and services provided by restaurants in Croatia. This publication can be considered as a gastronomic bible for all gourmets. This year, on June 20th, the 22nd award ceremony for the best Croatian restaurants was held in Rijeka (Trsat) and the restaurants selected for this event were evaluated according to certain criteria. The restaurant owners evaluated the restaurants in a questionnaire, as well as the guests who visited the restaurants. The votes were about the quality of food, drinks, services and surroundings. The members of the „Honorable board“ also made a field research and reviewed the received materials. 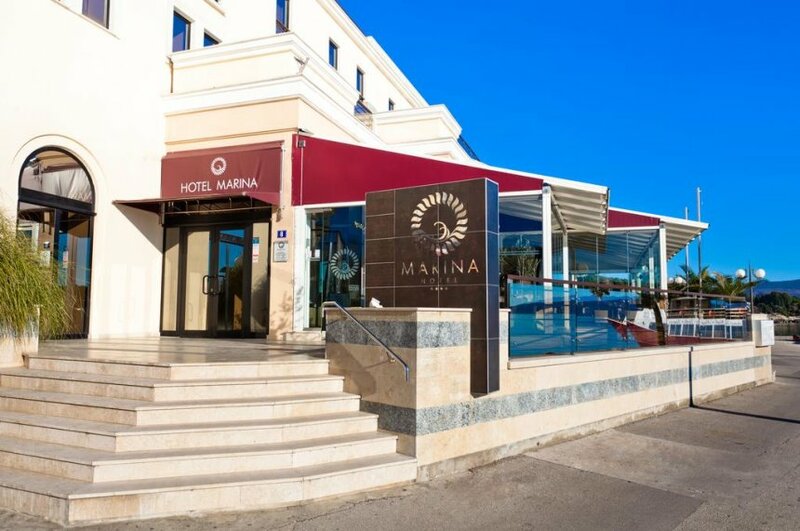 We are very proud that our Marina restaurant has again been included among the 100 leading restaurants in Croatia. Marina restaurant is a part of Marina Boutique Hotel – the most exclusive facility of the hotel company Hotels Krk. It is renowned for its sophistication, outstanding service and quality. In a pleasant surroundings directly by the sea, you can enjoy tasting local, national and international culinary specialties. Our chefs choose only fresh and seasonal ingredients, and they often create themed gourmet menus with focus on local and seasonal. We often participate in culinary events organized by Krk Tourist Bord, like asparagus days, lamb, squid and fig days etc. During this events, you can also enjoy traditional dishes which were prepared in local homes for generations as well as a variety of original dishes made for special occasions. Since the booklet „Top 100 leading Croatian restaurants and their recipes 2017/2018“ includes some of the restaurant specialties, we decided to share them with you too. Coat the beefsteak with steamed wild mushroom stuffing, roll it and cool down. Serve thin sliced fillets on arugula base and cover it with white truffle oil. Marinate the monkfish fillets in spiced herbs and olive oil and grill it. Fold the sheep cheese over monkfish fillets. Roast the fillets in the oven for 10 minuntes on 200°C. Serve with swiss chard dalmatian style. Over the years, the title of 100 leading restaurants has grown in importance and become even more prestigious. The restaurant owners are aware of that and strive to provide a high quality of service which is the only way to earn the place among the top 100 restaurants. If you decided to visit Krk, we invite you to stay with us at Hotels Krk! In addition to a comfortable accommodation, you can enjoy the delicious breakfast or lunch on the sunny terrace of our Marina restaurant or enjoy a romantic dinner with excellent music and dance performances. Visit us and soak up the magical Mediterranean atmosphere!